£2500 award for a distinguished thesis in an Asian subject falling within the scope of the Journal of the Royal Asiatic Society or of Modern Asian Studies. The thesis must have been examined and approved for the PhD degree at a British University in 2018. The date of the final approval letter must fall between 1st January and 31st December 2018. 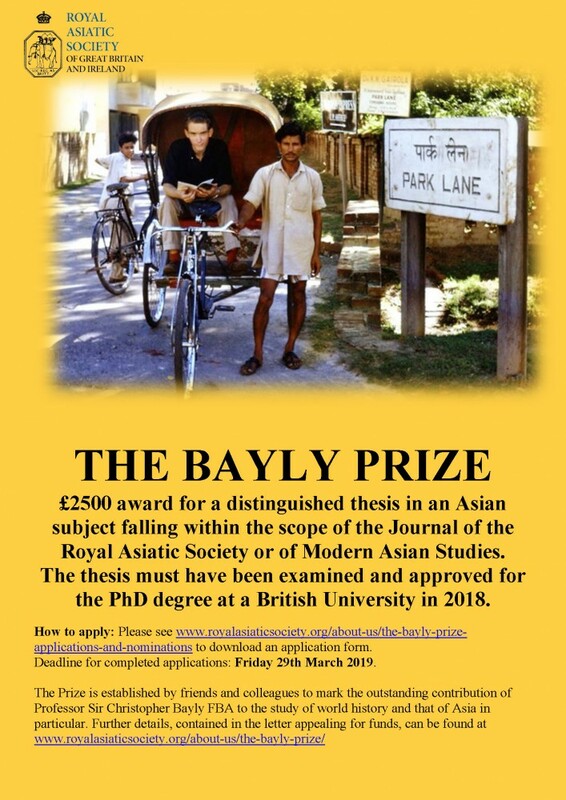 Please complete the application form BAYLY PRIZE APPLICATION FORM 2019, and return by email with a PDF of your thesis to The Director, Alison Ohta, ao@royalasiaticsociety.org, and The Events Officer Amy Riach ar@royalasiaticsociety.org by Friday 29th March. Supervisors may nominate by name alone, but this must be followed by a direct application by the graduate by the closing date of Friday 29th March 2019, and two references will still be required by the same date. Application details required: PDF of thesis, Name, contact details, University, Certificate of the award of the PhD degree in 2018, title of thesis, short synopsis (500 words), chapter headings, name of supervisor and/or examiners and contact details for two referees. Please note that references are also due by 29th March 2019 and should be sent to Alison Ohta ao@royalasiaticsociety.org and Amy Riach ar@royalasiaticsociety.org . Examiners and supervisors can be referees. Process: The panel of adjudicators is composed of: Professor Taylor Sherman (London School of Economics), Professor Naoko Shimazu (Yale-National University of Singapore), Professor Sunil Amrith (Harvard), Professor James Laidlaw (Cambridge) and Professor Rebecca Empson (UCL). Subject suitability enquiries may be sent to The Director by emailing ao@royalasiaticsociety.org. The winner will give a lecture at the presentation of the Prize at the RAS, and publication as a Royal Asiatic Society monograph will be offered. Other finalists will be eligible for consideration for an award of the Royal Asiatic Society’s Universities’ Prize Essay, and their work may be considered for publication by the RAS.